Discussion about changes in marketing is bubbling allover the web. LinkedIn -groups, Twitter, SlideShare… are full of opinions about best tricks in today’s marketing environment. As we all know, the playground has evolved. However, I don’t think much has really changed in human behavior towards marketing and the foundations are the same. People are still influenced by marketing and other people. They like to get acceptance and showoff their newest stuff – and identify with brands. However, the amplification of WORD OF MOUTH in social media has created a SOME WOM and the voice of an individual is now stronger than ever before. So the basic rules of marketing still apply, but now there is an added dimension – and this makes the game different for marketers. I went back to basics and started looking at the old AIDA marketing concept. Now, we are speaking of a model, that was developed between late 1800 to early 1900 by marketing professionals of that age. 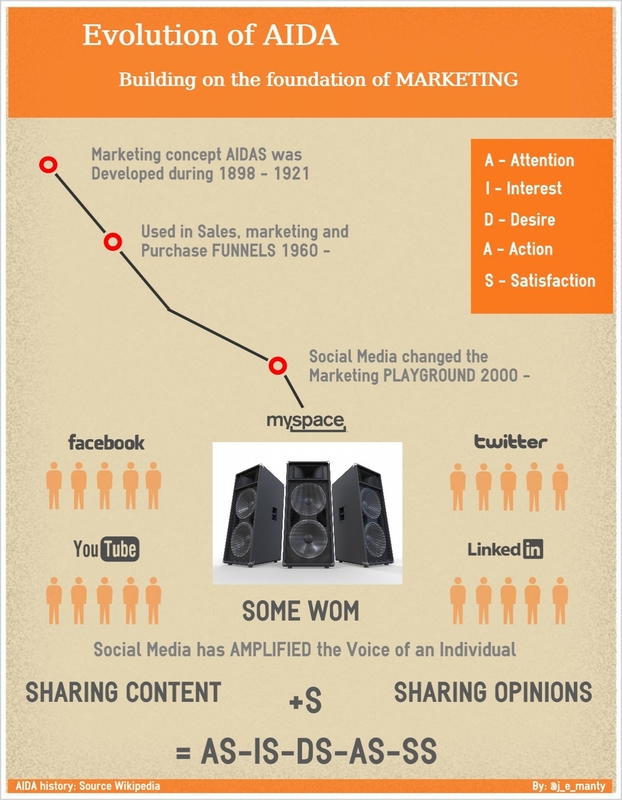 (see history on Wikipedia) AIDA concept by E. St. Elmo Lewis describes stages of human behavior towards marketing. Fifth sage (S) satisfaction was added to the concept in early 1900. SHARING interesting content to people trough social media. SHARING opinions of products, services and brands through social media. New AIDAS has a fluid form, where SHARING (+S) can appear after any stage of the concept. If sharing would happen after every stage of this concept, it would look like AS-IS-DS-AS-SS. So, how should marketers react to this change? 1. Produce content that people are willing to share with each other. On B2B side it is usually clever content that people can use in their work or get good ideas to do something better. It is usually not about your company and your products, but more or less knowing your industry and giving general advice. This kind of content is usually shared willingly through professional networks. On the B2C side it is usually “fun” content. As a recent example from Coca Cola: they printed names of people in their bottle labels and people got crazy. These pictures are all around Instagram and Facebook See: List of all found Coke bottle names. 2. As opinions of people are now amplified through social media, it is clear that companies have to think what kind of experiences they give to them. The importance of customer experience management grows significantly every day. SOME WOM can make your company a winner or loser. However, customer experience management is not only a responsibility of a marketing, it has to be embedded in to the soul of your company. I worked on a infographic to explain the evolution of AIDA. I did this for fun and to try out, what I can do with infographics. Bare with me, I am not a graphical designer. I am happy to get your comments on this post. What do you think? Does AIDA look like this in today’s marketing environment?